Get your Mod fix on a budget. 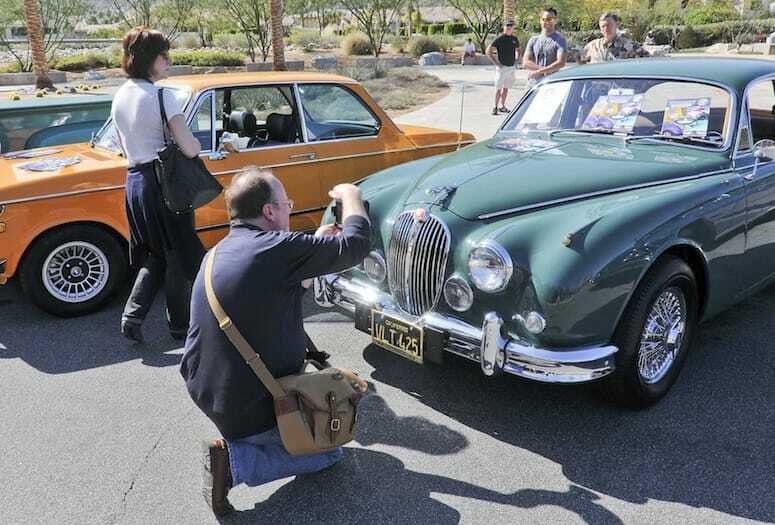 The Modernism Week Vintage Car Show is one of many free events during the 11-day fest. Modernism Week features a wide range of programming and many of the events are free or priced under $45. The festival runs from February 15-25, 2018 and features events at many Coachella Valley locations. For more informations, visit modernismweek.com. The new Grace Home Gallery, located at 1001 N Palm Canyon Drive, will unveil its new 2018 collection of midcentury photography. Located in the vibrant Uptown Design District, the gallery specializes in modern era photographers from the 1940s through the 1970s such as Slim Aarons and Bert Stern. More than 50 vintage restored and original American and European cars from the 1940s through the 1970s will be on display at this free event. This annual sale is produced by Modern Bear and hosted by H3K Home. It has become one of Modernism Week’s most popular free events – carefully curated vendors offer their highly coveted mix of vintage midcentury decorative furnishings, fashion, and collectibles. This year there will be two free Palm Springs Walk of Stars dedications. On Feb. 16, the public is invited to attend a special dedication for Paul R. Williams, one of the key architects (along with A. Quincy Jones and Donald Wexler) responsible for the iconic Town & Country Center in Palm Springs. The ceremony will be held at 2 p.m. at the Palm Springs Art Museum Architecture and Design Center, Edwards Harris Pavilion, 300 S. Palm Canyon Drive. The Palm Springs Walk of Stars will also honor renowned humanitarian Nelda Linsk, made famous in the iconic Slim Aarons photograph Poolside Gossip, at a star dedication ceremony at 2 p.m. Feb. 22 at 155 S. Palm Canyon Drive. Both events are free and open to the public. 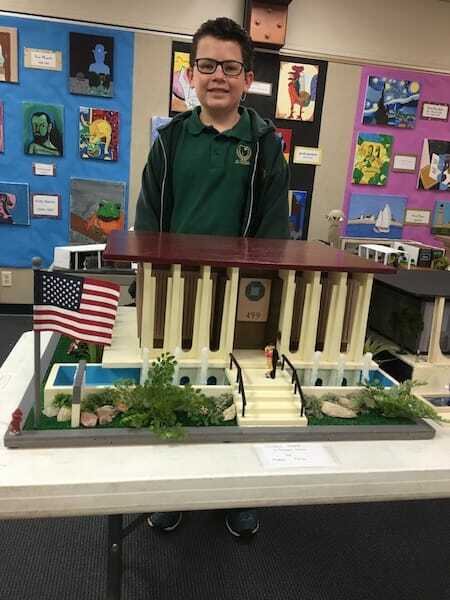 The sixth grade class of St. Theresa School in Palm Springs will exhibit projects inspired by important local midcentury architecture in the school’s art classrooms. The student creators will be on hand to answer questions about the event. Architecture historian and writer Robert Imber will also be available to answer questions about the school’s architecture and the models. Christopher Kennedy, together with Converso, the LA-based dealer of vintage furnishings, has decked out a pop-up space at 725 N. Palm Canyon Drive and will host a free champagne brunch. St. Theresa create replicas of midcentury buildings in Palm Springs. Come meet Palm Springs authors that have immortalized modernism in print. View a comprehensive photo essay about the impact of Wexler’s work in Palm Springs. “The Spirits of Palm Springs” is a sculpture exhibition that captures the immortal celebrity of some of Palm Springs’ most beloved past residents. The event will take place at The Hideaway, the quintessential midcentury hotel in Palm Springs’ Tennis Club neighborhood. Hosted wine and hors d’oeuvres included. Shag (aka Josh Agle) will unveil a new limited edition hand-pulled serigraph print. The event features live music by The Martini Kings and complimentary cocktails. Modernism Week’s “Community And Meeting Place”, known beter as CAMP, will provide a central hub for the fest from Feb. 16-25. Located at 230 Museum Way (directly across from the Palm Springs Art Museum in the future downtown Palm Springs public park space), CAMP will include an information desk, a box office, a café by Cheeky’s, the Modernism Week merchandise store by Destination PSP, a demonstration kitchen, designer lounges and a theater. Entrance into CAMP is free and open to the public. Hours are 9 a.m. to 6 p.m. daily. 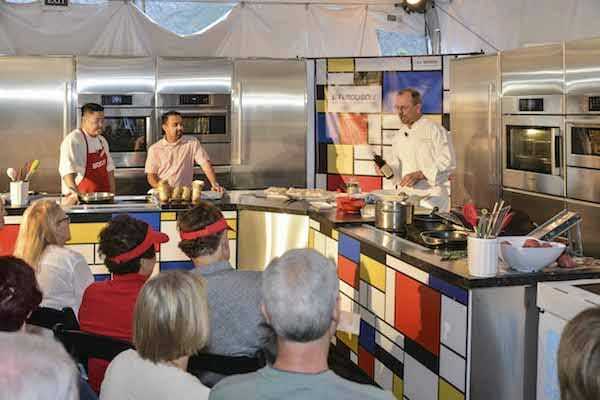 Sample a chef’s cooking at the Ferguson Demonstration Kitchen at CAMP. There will be several free events and “happenings” at CAMP that will offer fun and engaging activities for attendees. These include the “Poolside Gossip Meet and Greet with Nelda Linsk.” This is a one-of-kind opportunity to participate in the recreation of the famous 1970 Slim Aarons photo “Poolside Gossip” with Nelda Linsk, who was depicted in the photo taken at the celebrated Kaufmann House. Nelda will be at CAMP from 10 AM – 12 PM on Saturday February 17, 18, 24 and 25. Modernism Week sponsors will feature a wide range of free compelling activities at CAMP. Alfa Romeo returns to CAMP to provide attendees the opportunity to test drive the Alfa Romeo Giulia and the all-new Stelvio. For every test drive, a $20 donation will be made to Modernism Week’s scholarship fund, for student entering the fields of architecture and design. Dunn Edwards will display several SHAG prints and will provide complimentary color consultants to assist attendees in choosing the right color of paint for their projects. Corian Design will offer a free mobile phone charging station and will host two acoustic performances by the Dreamboats from 3-4 p.m. Feb. 16 and 4-5 p.m. Feb. 17. The Ferguson Demonstration Kitchen at CAMP will host design conversations, daily chef appearances and ongoing food preparation demonstrations with tasty samplings. Highlights include demos by visiting chefs Brooke Williams from Top Chef and the food styling duo “White on Rice.” Local chefs will also conduct demonstrations on weekends. There will also be free design talks with tastemakers and bloggers. A full CAMP schedule is at modernismweek.com. Atomic Ranch, the trusted Midcentury Modern resource, will offer three different seminars in the CAMP theater, each followed by a related home tour. This three-part series, moderated by Atomic Ranch brand leader and editor Sarah Jane Stone, offers compelling expert advice for midcentury modern architecture and design enthusiasts. Feb. 16: House Hunting; Feb. 17: Interior Design (featuring H3K Design, the Palm Springs-based design company); Feb. 18: Renovation + Preservation. The Palm Springs Modern Design Expo is a new event at the Palm Springs Convention Center showcasing cutting-edge modern design and technology. It adjoins the celebrated Modernism Show & Sale and a pass allows entry to both events. Palm Springs’ best known designer of this century, Martyn Lawrence Bullard, will share what it is like to design homes for celebrity clientele and how he was inspired by Palm Springs to renovate his 1963 Movie Colony hideaway by architect James McNaughton. This is a self-guided bike tour through the Indian Canyons neighborhood where docents at each stop will share information about the homes’ architecture and front door colors. Presented by Dunn-Edwards Paints and curated by Palm Springs Style. Attendees will step back in time as they “Span the Decades” through fashion. They will be transported through the eyes of Coco Chanel, Emilio Pucci, Christian Dior, and Pierre Cardin as Mitchells Palm Springs collaborates with M Vintage to display “Haute Couture” at its best. Guests will be escorted to the Grand Warsaw Ballroom at Temple Isaiah to enjoy a glass of bubbly and an assortment of biscuits and view the amazing fashion retrospective. Modernism Week has gathered leading luminaries in a wide array of fields to share their knowledge with Modernism Week participants. The talks take place during the 11 days of the festival and range in prices from $10 to $20. A full list of all available talks is on the modernismweek.com website. The Vintage Trailer Show is one of the most celebrated and exciting events of the second weekend. This thoughtfully curated collection of vintage trailers, campers, buses and motor homes is arguably one of the largest and most attended vintage trailer shows in the United States. Modernism Week has teamed up with Am Docs (American Documentary Film Festival) to host the first-ever Architecture Design Art Film Series. Held over three days (Feb. 23-25) at the Camelot Theater, the series will feature 26 films, documentaries and short films that cross 14 Modernism Week Programs. Two of the films will be reprise screenings of the Frey: Part 1 and Sinatra in Palm Springs films. Mod with a Twist has become one of the most sought-after tickets during Modernism Week. This popular “think and drink” event features thought-provoking and irreverent presentations and runs daily Feb. 16-24 with two alternating panel tracks (Mod Dreams and Mod Life). Five informative, amusing and captivating 10-minute talks will be presented by leading Modernists and guest presenters on an amazing range of topics, accompanied by a richly detailed audio and visual presentation. Back for the fifth year, these programs typically play to a full house. Design Onscreen’s new film, Frey: Part 1 – The Architectural Envoy explores Albert Frey’s early life and work in Europe and his New York architectural accomplishments in the 1930s. A post-screening reception will be held in the theatre’s lounge. The son (John Cho) of a renowned architecture scholar finds himself stranded in Columbus, Indiana – a small Midwestern city celebrated for its many significant modernist buildings by the likes of Eero Saarinen and I.M. Pei.